Astusjodur offers condolence cards. 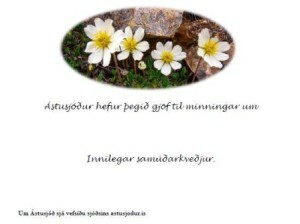 If you wish to honour a friend’s memory and support Astusjodur, you can do so by e-mailing minningarkort@astusjodur.is. Please state to whom the card is to be sent (name and full address), the name of the person you wish to remember, and the names you wish to list under the greeting. Astusjodur will send the card as soon as a donation is confirmed, which may take several days. The name of the person to be remembered and the names you wish to sign, will be filled in according to your e-mail mentioned abowe.